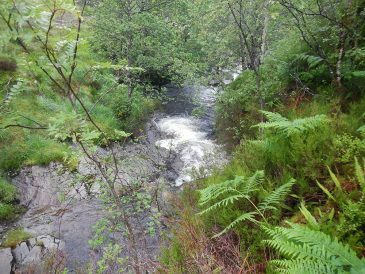 Renewables First has been commissioned to develop a hydropower scheme on Scottish Forestry Commission owned land in the Wester Ross area of the Scottish Highlands. Renewables First’s role extends to all stages of the scheme, including feasibility, consenting (including Planning and Scottish Environmental Protection Agency consents), full technical design and Installation. The main contractor involved with the installation works is Peter Bluett. 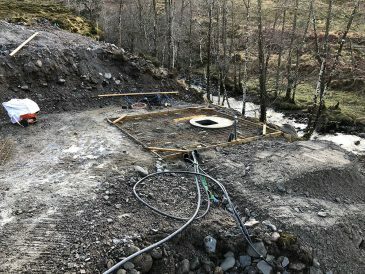 A Coanda water intake screen, located on the Allt Coire a Bhainidh, will mark the upper boundary of the hydro scheme. From this point, water will enter a 1.4 km buried pipeline navigating a topographical drop in height of 65 metres and finally connecting to a 100 kW Crossflow turbine, located in the turbine house. Given the long length of the pipeline relative to the drop in height, the hydro scheme is a relatively low pressure system. This enabled the pipeline specification to be different to that which is normally used in higher pressure set ups. 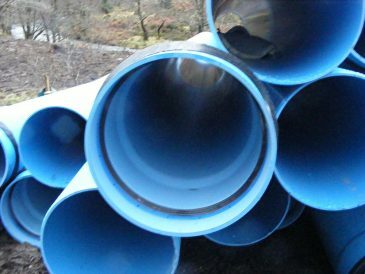 Instead of the standard HDPE system, PVC-O pipework will be used, which is essentially a giant push-fit system. This should enable a faster and more cost efficient installation – a worthy objective given that the length of the pipeline is roughly 1.4 km’s in length on a site with very difficult access. The turbine house will be of a prefabricated steel construction, which will screw directly to the concrete base. Concrete will then be poured into shuttering to create the walls. This type of construction is both cost effective and technically more straightforward, given the location of the site. The intake structure will also be metal framed and designed specifically to receive the Coanda screen. Intake structures are normally made from concrete, but the intake location and poor access would render this type of construction more difficult and costly. At the opposite end of the scheme at a location beneath the turbine house slab, concrete rings were used to construct the sump tube. This reduced the extent of excavation, saved time and is a safer method of creating the turbine sump. Turbine house location, pre-slab construction. 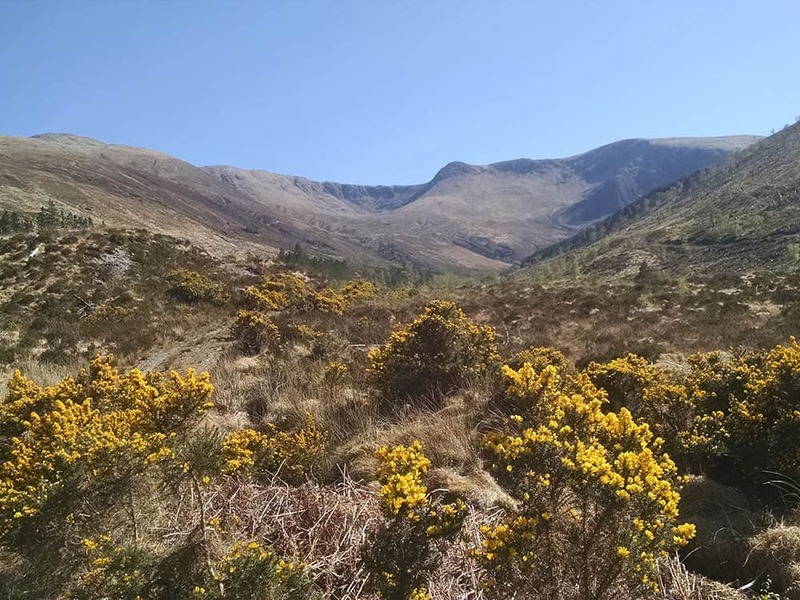 Once complete, it is calculated that the annual energy capture of the hydro scheme will be 457,000 kWh, equivalent to powering roughly 104 Scottish homes, with a CO2 emissions saving of 229 tonnes per year. 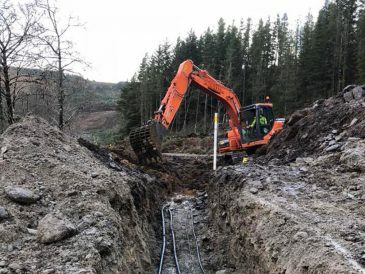 Construction works began November 2017, with the installation of a 500 metre long buried cable, connecting the turbine house location with the nearest accessible point on the national grid. An access track has also been created in order to allow plant and equipment to be transported to all points of the site. The turbine house base and slab is now in place, ready to receive the prefabricated structure. 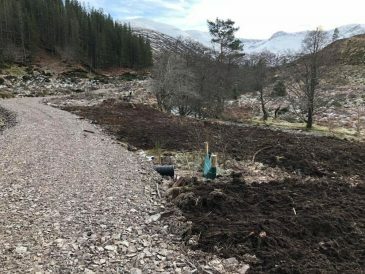 All of this was achieved despite challenging weather conditions, including a mix of heavy rain, sub-zero temperatures and blizzard conditions. It is anticipated that the grid connection will take place at around the end of February or early March. Delivery and installation of the hydro turbine will take place during late May / early June, with final commissioning taking place shortly thereafter.